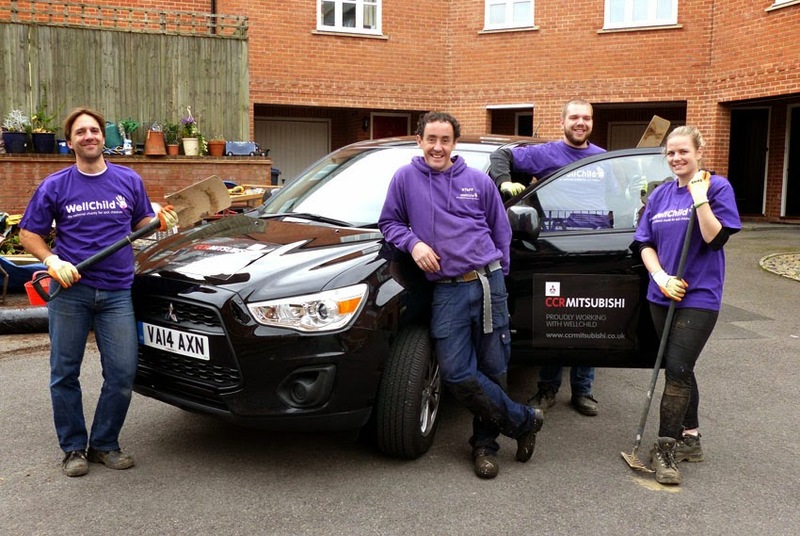 Cheltenham-based charity WellChild is hitting the road all over the UK helping seriously ill children and their families with vital home makeovers due to CCR Mitsubishi. and an ASX, which save WellChild money that would otherwise have been spent on hire cars and train travel. The cars are used for all the charity's needs, but one of their key uses is travelling to Helping Hands projects where WellChild organises a team of volunteers to remodel the garden or bedroom at the family home of a seriously ill child in order to make it more suitable for them and improve their quality of life. So far the cars have taken WellChild's Helping Hands team on more than 80 trips to visit 40 families across the UK from Dunfries in Scotland to Margate and Southampton on the south coast, saving WellChild £3,195 in the process. Overall the cars have saved WellChild an amazing £16,415 in transport costs. As well as lending their cars for the Helping Hands projects the team from CCR have also lent their muscle power. A team of volunteers from all of CCR Mitsubishi's dealerships will be carrying out a Helping Hands project in Swindon later this month for 13-year-old Molly who has complex care needs. And earlier this year a team of volunteers from CCR Mitsubishi's London branches helped relocate WellChild's garden from the Chelsea Flower Show to The Brook Special School in Tottenham for the children to enjoy. "CCR Mitsubishi's help for WellChild is phenomenal and is supporting our work in a really practical way. An organisation like ours, based in Gloucestershire but working around the UK, relies on great transport - and CCR provides that for us," said Colin Dyer, WellChild Chief Executive. "The cars help us in all areas of our work but the example of the Helping Hands projects shows a direct way in which these vehicles allow us to bring support direct to seriously ill children and their families in their own homes." Tim Bagnall, MD, CCR Mitsubishi, added, "WellChild are a national charity but they are based locally and we are always happy to help them. It's fantastic to see the vehicles we have lent them have made such a difference. Our staff all take the relationship with WellChild seriously and are always thinking of ways to support this great cause. We're really looking forward to helping transform Molly's garden later this month. It's a privilege to be able to help on projects like this."